Just recently CRI began a campaign to keep Transparent Delaware, our government payroll and vendor contract data website, open to the public by asking people to donate towards our goal of $5,000. 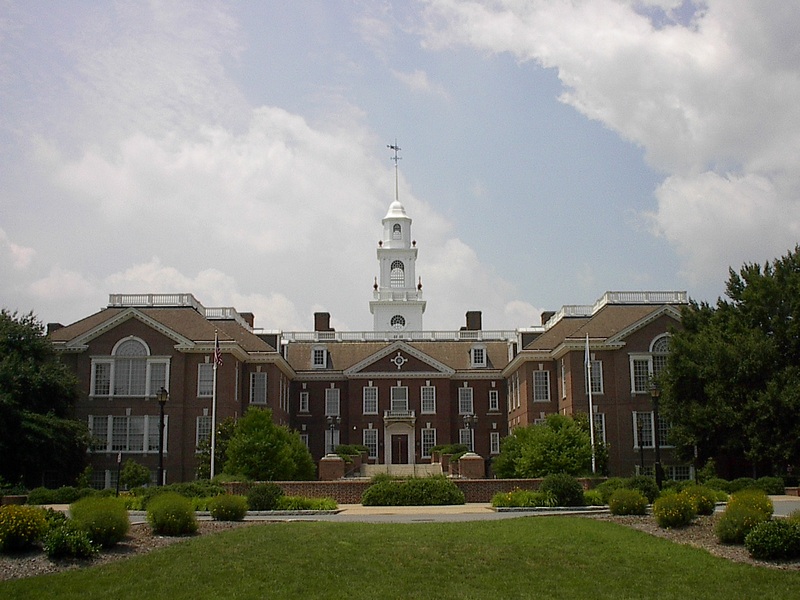 “We operate the website Transparent Delaware, which provides the public with open data on state payroll spending and state vendor payments. Want to know who the highest paid state employees are, by division or year? We have that. Want to see why an employee who was given a $60,000 base salary received $164,000 is overtime and “other” pay? We have that too. We would like to obtain state pension data but we have been blocked multiple times in our efforts to find out how much the state spend on employee pensions. While we recognize that state workers are human beings too the fact is, it’s our money and we should know how it’s being spent. With extremely few exceptions government spending data should ALWAYS be open to the public. What we need from you: It costs us about $5,000 a year to keep Transparent Delaware open to the public. All money collected for this campaign go to paying our web developer and host to keep the site up, or else we’ll have to shut it down :(. The exception is if you reach a donation threshold, we will send a small gift of thanks. As many before us have stated, “freedom isn’t free.” Now generally people who use this line are nearly always speaking about military service and the need for people to make some kind of meaningful sacrifice to keep our freedoms alive. But this axiom should apply as well to keeping information about our government available to the public. We have to pay our web host and site developer, and while they may be awesome people they have bills to pay too. Understandably many people are used to internet content being free or “freemium” and the more successful web pages can place ads on the site to make money, but we are a non-profit and we cannot, and will not, rent our website space over to advertisers. Thus, we need the generous support of people like you to help us reach our goal and keep Delaware state payroll and vendor data available to the public. National School Choice Week is here! Is it for You? This week is National School Choice Week, a week where we draw attention to the need for parents and families to have School Choice as an option for all students. If you believe government officials, union leaders, school boards, superintendents, Department of Education employees, and politicians can all make a better decision about your child than you can, school choice is not something you will support. But if you believe schools should be run at the local level, with fewer mandates from above and more support for those who are there day-to-day, and if you believe students are unique human beings who should not be forced into “one-size-fits-all” based on their parents’ financial ability to find another school, then school choice week is for you. If you believe there should be accountability for performance in our education system, without automatically blaming teachers and parents for poor performance, instead of the system which has been created, school choice is for you. If you believe public schools who wish to have your child attend should have to work hard for your tax dollars, like every non-monopolized market in the private sector (i.e. sectors where companies use government to give themselves business or hurt competition), instead of requiring children whose parents aren’t rich to go to a school based only by their zip code, school choice is for you. If the thought of stagnating academic performance, the rising number of students who enter college needing to take remedial classes, and the high drop-out rate for both high school and college bothers you, school choice is for you. If you believe money spent on education, where Delaware spends to the tune of $13,000 per student per year and $16,500 if you include capital spending (refurbishing or building schools, source: DE DOE), ought to be spent efficiently and with the student’s best interest at heart, school choice is for you. If you feel genuinely heartbroken every time you hear about another shooting in places like Wilmington, and know most of those young people get involved in drugs and gangs because they don’t have hope for a better future, school choice is for you. If you are concerned about the values being spread in society at large, and would like to see your child(ren) be placed in a school setting which is closer to the values you wish the child to learn, school choice is for you. If you believe America is a great nation with a lot of untapped talent among our youth, and want to see students use their talents in the best way possible, school choice is for you. And lastly, If you believe a high-quality education is a fundamental right for each child to have, then school choice is for you. If you believe school choice is something we can all work for together, then join the Caesar Rodney Institute in celebration of National School Choice Week, and let’s support #SchoolChoice! Why do you support school choice? Are We Killing Small Business in America? Since 2008 America has seen a greater number of businesses close than open. According to Gallup, roughly 6 million businesses out of 26 legally recognized actually function; the rest are inactive or exist only on paper. Of these 6 million “real” businesses, 3.8 million employ 1-4 employees. Only about 108,000 businesses in America (2% of “real businesses”) employ 100+ people. If we continue to kill off small business with over-regulation and over-taxation, how will the government be able to pay its bills, short of more printing, borrowing, and cancelling debts? “The U.S. now ranks not first, not second, not third, but 12th among developed nations in terms of business startup activity. Countries such as Hungary, Denmark, Finland, New Zealand, Sweden, Israel and Italy all have higher startup rates than America does. We are behind in starting new firms per capita, and this is our single most serious economic problem. Yet it seems like a secret. You never see it mentioned in the media, nor hear from a politician that, for the first time in 35 years, American business deaths now outnumber business births. 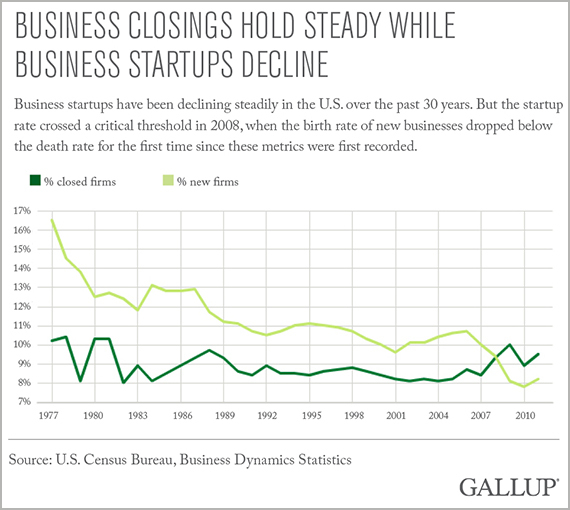 The U.S. Census Bureau reports that the total number of new business startups and business closures per year — the birth and death rates of American companies — have crossed for the first time since the measurement began. I am referring to employer businesses, those with one or more employees, the real engines of economic growth. Four hundred thousand new businesses are being born annually nationwide, while 470,000 per year are dying. You may not have seen this graph before. Until 2008, startups outpaced business failures by about 100,000 per year. But in the past six years, that number suddenly turned upside down. There has been an underground earthquake. As you read this, we are at minus 70,000 in terms of business survival. The data are very slow coming out of the U.S. Department of Census, via the Small Business Administration, so it lags real time by two years. Here’s why: Entrepreneurship is not systematically built into our culture the way innovation or intellectual development is. You might say, “Well, I see a lot of entrepreneurial activity in the country.” Yes, that’s true, but entrepreneurship is now in decline for the first time since the U.S. government started measuring it. No matter how much some people will try to convince you the Roaring Twenties are back, the reality is that we have far too many businesses closing and not enough replacing them.Businesses do open and close all the time, but a lot of business closings are small businesses getting shut down because of government policy via regulation and taxation. A lot of these policies are Cronyist policies pushed by big business to weaken their competition, which is smaller stores. Thus for example, a big chain like Costco can safely come out in favor of the minimum wage increase knowing it will end up hurting the roughly 80 percent of businesses which employ nine or fewer people, while at the same time reaping the benefits of “caring” for their employees (note: we don’t object to Costco paying its employees well; we applaud it. But just because Costco might be able to afford a wage increase doesn’t mean every business can). Crony business policies, government bureaucrats who make new regulations to justify their jobs, politicians who want to “do something” to get votes, and a well-intentioned but misinformed public which votes for things like minimum wage hikes all result in a decline in new business startups and jobs lost and never created in the first place. We at CRI support economic policies which make it easier for people to start businesses and create new (hopefully well-paying) job opportunities without sacrificing necessary regulations and basic standards of decency. But unless we fundamentally change the way our country is operating, that 70,000 per year decrease in total businesses operating in America will increase in number. Help support CRI! Your support allows us to research and provide analysis to the public on policies which will best grow the economy and create jobs. An end to the prevailing wage, Right to Work legislation, an end to Delaware’s gross receipts tax and lower corporate income taxes and personal income taxes, health care reform which encourages innovation from the private sector, and energy policies which would give people more choices would go a long way to helping Delaware, and America, make a sound economic recovery for all. Please consider making a contribution today. Yesterday, January 7, our Director of the Center for Economic Policy and Analysis (CEPA) Omar Borla appeared on 104.1 and 930 AM “La Exitosa” (the success) on the Cristian Tijerino show for a Spanish-language interview about the most recent Friedman Foundation poll on attitudes toward school choice. The interview transcript is available by request and we will begin to integrate more content towards the Hispanic community, which comprises nearly 8% of the state’s total population. The observation Cristian made was that for many Hispanic families, lack of information about school choice options prevents them from ever considering alternatives such as charter schools or private schools. Since many parents are either not able or capable of homeschooling or cyber-schooling their children they are often left in the traditional public school system, typically in schools which lack the resources to properly educate Hispanic children. Many Hispanic children come from homes where one or both parents do not speak English and it is this language barrier which discourages many parents from being more active in their children’s education, whether that means not going to parent-teacher conferences or being able to help with homework. Omar explained the poll results and pointed out the huge enthusiasm gap between people of ALL groups who supporter school choice versus those who don’t. For Hispanics 74% of parents and for Blacks over 70% of parents were supportive of the idea of charters and vouchers. You can read the full results by clicking that link but there were overwhelming majorities in every demographic group: ethnicity, age, gender, party affiliation, among others. In regards to the Hispanic community, where language is often a barrier, the question is what to do to help bridge this gap. Cristian pointed out that in addition to a lack of information about education alternatives, two other barriers which exist are: lack of interest with many parents in regards to the children’s education (NOT the same as not caring- just means by and large accepting the status quo without personally seeking alternatives) and also the negative perception floated around about alternatives. Cristian cited one parent who told her he though charter schools were for “kids with learning problems.” Many told her they thought charter schools are private schools and thus they cannot afford them. Omar answered this by showing a data point where support for charter schools, vouchers, and Education Savings Accounts went up in every demographic when the options were explained, meaning more people were supportive when the understood exactly what these ideas were. Understandably school choice isn’t good for every child but parents can and should be better educated about these opportunities. Efforts to misinform parents about what these options are (how else would a parent think charter schools were private schools) are well underway and it’s up to us to counter these false perceptions. At the end of the day we have only one question for parents, grandparents, legal guardians, educators, principals, elected officials, appointed officials, community leaders, and everyone else: Of all these groups, who is likely to know best what is best for the child? We’re going out on a limb and saying “Education Department bureaucrats” and “elected officials” are not going to receive the majority of votes.